Ha Ha Ha.. below is an excerpt from Paul Wildlifewriter's blog in the UK on the subject of Ospreyitis....hilarious and all too familiar, tho I don't spend much time watching Ospreys on the computer, My addiction is to watching them in person, which presents its own problems....risking my life and others lives by driving like a maniac to follow an Osprey carrying a stick, injuries caused by crashing thru the underbrush and cat tails because I can hear an Osprey's courting vocalization, but I can't spot him...peeing really fast behind a tree before someone comes along, having double vision after hours of looking thru a spotting scope with one eye closed, chronic neck pain from sitting in the car looking to the left with my scope mounted on the window...there are so many different symptoms of Ospreyitis, but it's a pretty easy diagnosis. A seasonal disorder characterised by the patient identifying any flying creature, from a hawk-moth to a harpy eagle, as an osprey. May be transmitted from one person to another. There is no known treatment. A neuropsychiatric condition whereby people in bird hides feel compelled to start talking complete nonsense whenever the subject of ospreys is mentioned. Typical symptoms include “An osprey cannot let go of a fish after it's caught one, so could get pulled under and drowned.” “Osprey eyesight is ten times better than a human's.” “All ospreys migrate at the same time, following each other so they know where to go.” (etc). Symptoms may be alleviated by poking the patient in the eye with a sharpened stick or equivalent. 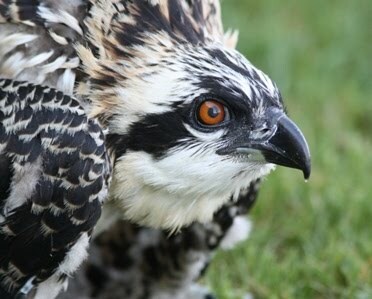 Pathological sleep-deprivation caused by worrying about what ospreys are going to do next. (Trample on their eggs... fall out of the nest... get wet... etc.) Most acute during the breeding season but can occur at any time. Medication is ineffective, but the symptoms may be alleviated by striking the patient over the head with a blunt instrument. A painful affliction of the feet caused by walking around Welsh marshland looking for ospreys. An inexplicable enlargement of the nether regions and buttocks caused by sitting immobile in front of a computer monitor for five months. Treatment: android tablets. An uncomfortable and potentially dangerous distension of the bladder and/or urethra. Caused by the patient's unwillingness to go the the lavatory in case he/she misses anything interesting on the nestcams. Treatment: plastic bucket or unused soup tureen." The year 2015 was a successful year for the Ospreys in the eight county metro area surrounding Minneapolis and St Paul. Osprey sightings were reported as early as March 20, but the first Osprey positively identified was our second oldest banded male, at 22 years of age, back on his nest on March 31! This year must be characterized as a very productive one for the Osprey population in this 31 year study. The number of chicks rose dramatically as the number of nests increased somewhat. (There may be more nests we do not know about.) There were 110 nests which were occupied* by a pair of adult ospreys. One additional nest was thought to be a frustration nest and therefore not counted as a separate territory. Eggs were laid in 97 nests (89 in 2014) and 75 of these nests had at least one chick that was confirmed to have fledged successfully or survived to fledging age (71 in 2014). There were 35 nests which failed (30 in 2014). There are two distinct subcategories under failures; nests where a pair was present but no eggs were laid (10) and nests where eggs were laid but they failed to successfully fledge a single chick (25). One of these nests was discovered late in the season, when it was not known if eggs were laid or not, but no chicks were ever observed. The neighbors reported that this nest had been active for many years, (though unknown to us until this year) with a pair present in the early spring. There were 182 chicks that were known to have fledged successfully or survived to fledging age! This is a surprisingly high number compared to past years and it is noted that most successful nests had two to three chicks (29 nests with two chicks and 38 nests with three chicks) with only eight nests that produced a single chick and one that produced four chicks. There was a moderately high mortality rate this year with at least 30 additional chicks which were known to have died or disappeared before fledging. Four adults also died or disappeared midseason. There were 100 adult Ospreys identified by their bands. One of these was from Iowa, and one was from southern Ontario. There were 11 new nesting territories that we know of, including the nest that was newly discovered this year (mentioned above). Only three of these new nests successfully fledged chicks. The overall productivity of occupied nests which were successful this year was 68%, (70% in 2014, 67% in 2013, 77% in 2012). The mean number of young fledged per successful nest was 2.43 (1.77 in 2014). The mean number of young fledged per active nest was 1.88 (1.41 in 2014) and the mean number of young fledged per occupied nest was 1.65 (1.25 in 2014). These numbers reflect a significant increase in productivity per nest, especially in comparison to the drop in productivity noted in 2014. There was a notable cluster of ten nests which all failed within a small area, (approx five mile radius). The causes for these mortalities are not entirely clear. A few nests were harassed by eagles. At least one nest was a known predation, probably by Great Horned Owls, as the adult females headless body was found beneath the nest. We hope to increase the monitoring on these nests in 2016. Some losses in other areas of the metro can be attributed to a large storm on July 18. Two nests were completely blown down and all chicks died, and many other nests had some missing chicks after that storm. Our oldest male on record, at 23 years of age, died this year after returning late from migration. Our oldest banded female also died this year at 21 years of age from unknown causes. The banding program at Three Rivers Park District continued to be severely curtailed with only 15 chicks at six nests receiving bands. Any use of this data should have its source appropriately acknowledged. There are so many people who have been instrumental in helping Twin Cities Metro Osprey Watch continue this Osprey research. Special thanks to Alice Stoddard, Barb Ankrum, Grace and Roger Pass, Faith Christine, Margaret Wurtele, Ellie Crosby, Phyllis Bofferding, Janice Dunlap, Mary Mullett, Carol Christians, Nancy Albrecht, Perry Westphal, Nikki Schiers, Jim Radford, Larry Waldhauser, Erik Gulsvig, Georgianna Smith, Dani Porter Born, Barbara Gaughan, Melinda Grahl, Margaret Hutchinson, Tom Schmelzer, Karen Akins, and Steven Steinborn, for sharing their observations, their commitment to this effort, their photos, and their love for these birds. Thanks to all the private property owners who are such important and wonderful hosts to our Ospreys, and who have provided me access to these nests for monitoring. Special thanks to Tom Burrrows at Aggregate Industries, Mary Lee at the National Guard, and Erick Tuckner at Bolander Construction, for all their cooperation in allowing me to monitor nests on their properties.